MAMMOTH were a truly larger than life rock outfit led by the man mountain singer Nicky Moore and big bald bearded bassist John McCoy famed for his former years in chart topping Gillan. 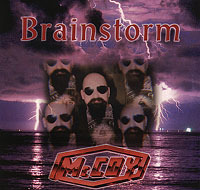 The band lasted from late 1986 to the end of 1989 yet they released only one album until now that is as John McCoy has delved into his Mammoth tape vaults. 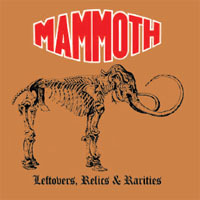 Leftovers,Relics and Rarities is exactly what it says, a 17 song collection of bones that build into a portrait of what Mammoth might have been before Intelligent Design (evolution would never have made such a mess of things) got hold of it...Too long seen as little more than a fat joke taken too far, this is Mammoth as they should have been, a massive band with a sound to match and, like their namesake, an unstoppable musical force of nature. Now you can hear them bellow once more. ...the aural paraphernalia gathered here presents an interesting insight in the stomper's modus operandi...these bones are precious.